24 November 2015, at 6:00a.m. Infectious bronchitis poses an on­going risk to the global poultry industry. In nearly every country, field viruses of various serotypes and genotypes challenge chicken flocks, rendering vaccination a compulsory part of the veterinary health management programme. Field strains circulating regionally and locally throughout the world are observed to vary significantly, with subsequent consequences for vaccination strategies. This is the first of an on-going series of articles that reports on observations charting predominant IB strains in Europe, the Middle East and North Africa. Choosing appropriate genetic strains in the live vaccination programme can generate a broad spectrum of protection against known field strains as well as novel viruses not expected in that geographical area. The ability to give live vaccines from day of age provides a mechanism to protect chickens from early field challenge. On-going monitoring of circulating field viruses is a key requirement of optimising vaccine choice and timing of application. MSD Animal Health has teamed with x-OvO Limited, an industry-leading specialist in genetic mapping of field viruses, to understand how viruses vary and the implications these variations have for the vaccination programme used. Whilst the use of sequencing PCR techniques to create genetic "finger prints" is an important way to accurately identify IB viruses, it is difficult to understand the immuno­logical properties of a field virus using only genetic information. Since antibodies that neutralise infections recognise the three dimensional shape of proteins on the outside of the virus, analysing the sequence of the amino acid building blocks of these proteins gives insights into virus behaviour that are not possible with genetic sequencing alone. Most samples for these surveys were taken from the cloaca, the preferred sampling route two weeks post live vaccination. Significant numbers of samples were submitted from multiple sampling sites in the chicken. Multiple site sampling is discouraged since pooled analysis of samples can lead to false negatives when tracheal sample negatives (in general, vaccines and field viruses disappear from this organ first) can dilute down cloacal positives (where viruses tend to be detected for longer) leading to an overall negative result. 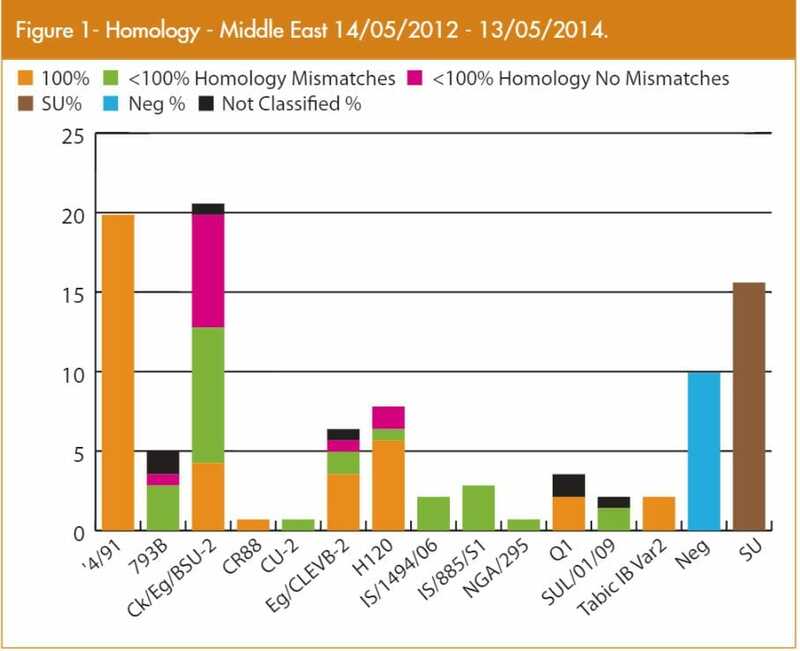 Extensive surveying in the Middle East and North Africa (figure 1; sampling focused on Saudi Arabia and Egypt) reveals the existence of field viruses that are distantly related to European-derived vaccines. The IB 4/91 vaccine is frequently used to broaden protection against variant strains, and when flocks are vaccinated with IB 4/91, it can be recovered with 100 per cent homology to the precise genetic form of the original vaccine virus. Of the field strains encountered, the BSU-2 and CLEVE/ IS1494/ IS885 strains (all identical in the region of the S1 gene where key genetic changes occur and define genotype) are the most significant field virus findings. In particular, the BSU-2 field virus is associated with severe respiratory problems in broiler flocks are early ages, with positive field find­ings occurring around 2 weeks of age. During the sampling of approximately 2000 flocks from 2012-2014 in Europe (figure 2; including countries on its Eastern borders and Russia), MSD Animal Health mapped the most important infectious bronchitis field virus challenges. Samples were taken in approximately even proportions from broiler flocks and future and current laying birds. Approximately 60 per cent of samples were positive for IB, and these positive results came mostly from flocks where performance was compromised in some way (exhibiting respiratory tract pathology, mortality, wet litter/enteritis or egg drop). The findings demonstrated clearly that, viruses of the 793B and QX genotypes were the most common field infections. The 4/91 vaccine (in orange) is a 793B type virus. The 4/91 vaccine was a component of most of the vaccination programmes and was isolated from vaccinated flocks in its original precisely defined genetic form without evidence of subpopulations or genetic drift. The 793B field strains (graphed in green in figure 2) showed significant variation from its respective vaccine reference strain at both the genetic and amino acid (protein structure) levels. Note that classification of viruses in groups means they were more like the 793B (4/91) reference strain than anything else identified in global databases. However, some of the viruses are quite different from the 793B reference strains. This type of finding is supportive of the adoption of an IB protectotype multi-strain vaccination programme to broaden the protective spectrum achieved post vaccination. The second significant category identified was QX field viruses. On initial inspection, the figure 2 graph suggests most of these viruses differ from the vaccine strain (viruses identical to the vaccine strain appear in red). In order to better understand this observation, x-OvO Ltd. conducted a highly sensitive sequencing of a vial of QX commercial vaccine. At that time, only one commercial QX vaccine was being sold in the EU. Results from the field indicated that viruses with small genetic differences to the expected vaccine strain and that did not change the amino acid (protein) structure sequence were found in EU countries where the most live commercial QX vaccine is used. These small genetic changes were found as minor components of the QX vaccine vial. 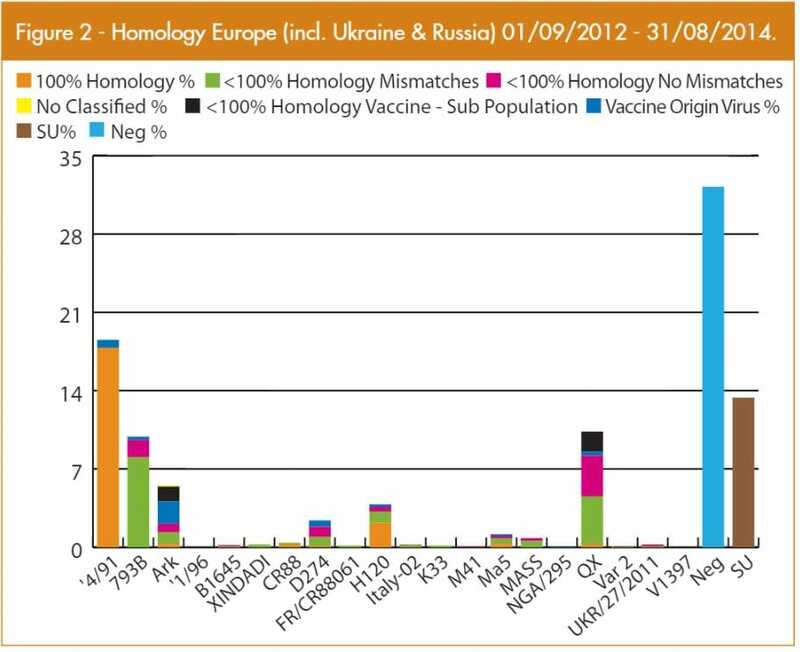 Hence a vaccine-origin virus category (graphed in pink) is shown above. When this vaccine origin category is removed, the dataset demonstrates that 793B field viruses are the most prevalent finding followed by QX field viruses. The lack of a major Massachusetts genotype field challenge is notable and may be explained by the fact that almost every chicken sampled would have had some type of Massachusetts vaccine. Vaccine of the Massachusetts and Holland strain genotypes were recovered in small quantities only. All Arkansas viruses graphed in figure 2 were found in the United Kingdom and all variation that occurs in Arkansas positive results originates from vaccine viruses (Arkansas plus mild Massachusetts is a licenced commercial vaccine in that country) as they circulate through flocks. No true field Arkansas viruses were found in the geographical area studied. The SU category (sample un-typable) related to finding minute quantities of infectious bronchitis genetic material that cannot be sequenced. These results are often found long after live infectious bronchitis vaccination when no infec­tious bronchitis field infection is present. They reflect the decay of a live vaccine in the flock over time. Only very rarely is this category an indicator of novel infectious bronchitis viruses requiring the development of new genetic sequencing protocols. Key conclusions of this comprehensive study of the vaccine and field strains circulating in Europe and the Middle East/ North Africa is the essential requirement to protect birds against 793B and QX field challenges in Europe and the necessity of broad protection to achieve the best potential performance in the Middle East. Thus the combination of IB Mas plus IB 4/91 vaccine in the framework of an IB protectotype vaccination programme may be considered as a core competency from a vaccine selection perspective. The study of this vaccine combination on some 27 diverse field viruses provides the largest dataset of any commercial vaccine combination yet studied (data on file) and gives producers the most versatile way to protect against the two major circulating strains in the region together while reducing the risks associated with novel field virus introductions. A key advantage of the 4/91 genotype when given in combi­nation with Mas vaccine strain is its ability to retain a precisely defined genetic form. Field studies in France in long-­lived broiler flocks (83 days of age) have documented the presence of a form of 4/91 virus that is 100 per cent homologous to the initial vaccine virus that colonises the bird immediately after administration, at day of age, of an IB Mas plus 4/91 vaccination programme. The stability of the genetic form of IB 4/91 enables monitoring of appropriate vaccine application - if the vaccine virus is not detected at time points as expected, the absence triggers an audit of vaccine application techniques to optimise the flock's vaccination 'take' response and, subsequently, the level of protection obtained. A quality control programme featuring this kind of monitoring strategy is more difficult with other commercial vaccines due to their tendencies to vary at both the genetic and the amino acid levels as they circulate through the flock.